Schematic diagram of basal ganglia circuitry. 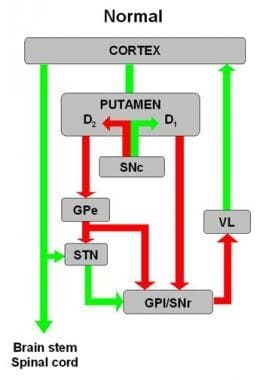 Inhibitory (red arrows) and excitatory (green arrows) projections between motor cortex, putamen, globus pallidus pars externa (GPe) and globus pallidus pars interna (GPi), subthalamic nucleus (STN), substantia nigra pars reticulata (SNr) and substantia nigra pars compacta (SNc), and ventrolateral thalamus (VL) are represented. D1 and D2 indicate direct (regulated by dopamine D1 receptors) and indirect (regulated by dopamine D2 receptors) pathways, respectively. Stereotactic surgery is considered for PD patients who have motor fluctuations and dyskinesia that cannot be adequately managed with pharmacologic manipulation. The principal surgical option is deep brain stimulation (DBS), which has largely replaced neuroablative lesion surgery. Experimental surgical approaches include transplantation and gene therapy. During stereotactic surgery, imaging data are correlated to a 3-dimensional space, permitting a target deep within the brain to be reached blindly and with minimal trauma. With frame-based techniques (see the image below), application of a reference coordinate system to the skull permits any point in the brain to be described with Cartesian (ie, x, y, z) coordinates. Ventriculography, an important method for target localization before the development of computed tomography (CT) and magnetic resonance imaging (MRI), is now rarely used. Stereotactic headframe is applied at start of surgery. MRI-localizing box is attached to frame only during targeting MRI. Localizer defines working volume of frame and provides reference coordinate system from which target coordinates are derived. CT-guided stereotaxis provides direct imaging of brain parenchyma without image distortion; however, its gray-white resolution is inferior to that of MRI, and it can provide only axial imaging. MRI provides superior target resolution and triplanar imaging; however, some smaller targets may not be visualizable, and MRI is prone to image distortion. Although these distortions are usually small, they can affect targeting for functional neurosurgery. 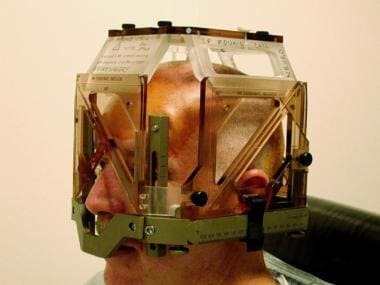 The possibility of targeting errors due to image distortion necessitates the use of some form of intraoperative neurophysiologic monitoring to confirm correct targeting during surgery for movement disorders (see the image below). Intraoperative physiologic monitoring equipment. Surgical team, consisting of neurosurgeon, neurologist, and highly trained neurophysiologist (pictured), employs single-cell microelectrode recording to define surgical target physiologically. A comparative study suggests that an image fusion technique making use of stereotactic CT and MRI may be able to record a significantly longer subthalamic nucleus (STN) length through limited microelectrode recording than MRI alone can. [3, 4] Further study is needed to determine whether this technique could be effectively used to improve clinical outcome and reduce morbidity. Until comparatively recently, surgical treatment of movement disorders primarily involved neuroablative lesion surgeries that destroyed abnormally hyperactive deep brain nuclei. However, the observation that high-frequency electrostimulation in the ventral lateral nucleus (VL) of the thalamus eliminates tremors in patients undergoing thalamotomy led to investigation of long-term deep brain stimulation (DBS) as a reversible alternative to neuroablation. 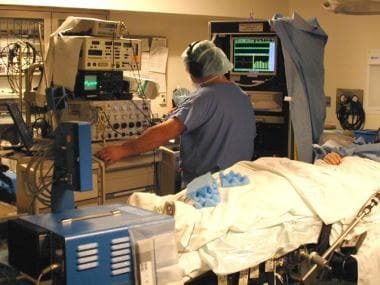 DBS has become the surgical procedure of choice for Parkinson disease (PD) because it does not involve destruction of brain tissue; it is reversible; it can be adjusted as the disease progresses or adverse events occur; and it allows the performance of bilateral procedures without a significant increase in adverse events. Sagittal section, 12 mm lateral to midline, demonstrating subthalamic nucleus (STN; lavender). STN is one of preferred surgical targets for deep brain stimulation to treat symptoms of advanced Parkinson disease. A more extensive discussion of DBS in this setting, including mechanisms of action, advantages and disadvantages, and stages of the procedure, is provided elsewhere (see Deep Brain Stimulation in Parkinson Disease). Neuroablative lesion surgeries involve the destruction of targeted areas of the brain to control the symptoms of Parkinson disease (PD); they have largely been replaced by deep brain stimulation (DBS). During neuroablation, a specific deep brain target is destroyed by means of thermocoagulation. A radiofrequency generator is used most commonly to heat the lesioning electrode tip to the prescribed temperature in a controlled fashion. The 2 most commonly performed neuroablative procedures are thalamotomy and pallidotomy, in which lesions are created in the ventral lateral thalamic nucleus (VL) and the internal segment of the globus pallidus (GPi; also known as the globus pallidus medialis), respectively. The VL receives afferent innervation from 2 primary sources: the GPi via the ansa lenticularis and thalamic fasciculus and the contralateral cerebellum via the superior cerebellar peduncle. These cerebellar fibers synapse primarily in the ventral intermediate (VIM) and ventral oral posterior (VOP) segments, the most posterior segments of the VL. Oscillating excitatory input from the cerebellum may be responsible for the tremor observed in PD, in that cellular activity synchronous with the frequency of parkinsonian tremor can be recorded in the VL. These data support the clinical observation that lesions placed within the VL (and specifically within the VIM or VOP) arrest parkinsonian and essential tremors. In this procedure, a part of the thalamus, generally the VIM, is destroyed to relieve tremor. The VIM is almost unanimously considered the best target for tremor suppression, with excellent short- and long-term results in 80-90% of patients with PD. Thalamotomy has little effect on bradykinesia, rigidity, motor fluctuations, or dyskinesia. When rigidity and akinesia are prominent, other targets, including the GPi and the subthalamic nucleus (STN), are preferred. Thalamotomy is indicated in patients with PD who are disabled by medically refractory tremor. The anticipated benefit of tremor reduction or elimination must be considered carefully. Rest tremor alone is rarely disabling, and bradykinesia and rigidity can reduce dexterity irrespective of tremor. Most patients with PD who undergo thalamotomy have significant improvement in tremor of the limbs contralateral to the side of the lesion. Bilateral thalamotomy is generally avoided, because complications, especially speech and cognitive impairment, are common. Morbidity for thalamotomy is reported to range from 9% to 23%. The predominant complication is speech impairment with dysarthria and hypophonia. The risk of speech abnormalities is 30% after unilateral thalamotomy and greater than 60% after bilateral thalamotomy. Other complications include memory loss, contralateral hemiparesis, and, more rarely, hemineglect, dystonia, hemiballismus, athetosis, and dyspraxia. Preoperative memory and language evaluation can help identify patients who are at greatest risk for postoperative cognitive and language dysfunction. In the largest series, the mortality for thalamotomy ranged from 0.5% to 1%. Death results almost exclusively from intraparenchymal hemorrhage. Although Svennilson et al described ventral posterior pallidotomy back in the 1960s,  their report was largely overlooked. The original pallidotomy target was in the medial and anterodorsal part of the nucleus. This so-called medial pallidotomy effectively relieved rigidity but inconsistently improved tremor. The negative symptoms of PD (ie, rigidity and bradykinesia) are caused, in part, by excessive inhibitory output from the GPi to the VL thalamic nucleus. 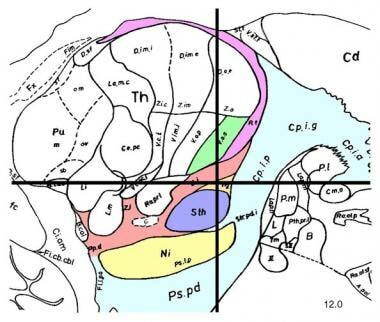 Lesioning of the sensorimotor region of the GPi, which lies ventral and posterior in the nucleus, decreases this hyperinhibition of the motor thalamus. Pallidotomy involves destruction of a part of the GPi. Pallidotomy studies have demonstrated significant improvements in each of the cardinal symptoms of PD (tremor, rigidity, bradykinesia), as well as a significant reduction in dyskinesia. However, the tremor improvement is less consistent than that seen with thalamotomy. The most serious and frequent (3.6%) adverse effect of pallidotomy is a scotoma in the contralateral lower-central visual field. This complication occurs when the GPi lesion extends into the optic tract, which lies immediately below the GPi. The risk of visual-field deficit is reduced greatly by accurate delineation of the ventral GPi border by microelectrode recording. Less frequent complications (< 5%) include injury to the internal capsule, facial paresis, and intracerebral hemorrhage (1-2%). Abnormalities of speech, swallowing, and cognition may also be observed. Bilateral pallidotomy is not recommended, because complications, including speech difficulties, dysphagia, and cognitive impairment, are relatively common. Hyperactivity of the excitatory projections of the STN to the GPi is a crucial physiologic feature of PD. Subthalamotomy involves destruction of a part of the STN. Although lesioning the STN usually has been avoided because of concerns that hemiballismus might develop, experimental results from animals and humans suggest that subthalamotomy may be performed safely and may reverse parkinsonism dramatically. Studies have shown significant improvements in the cardinal features of PD, as well as the reduction of motor fluctuations and dyskinesia. Good surgical outcomes from stereotactic surgery for Parkinson disease (PD) begin with careful patient selection and end with attentive, detail-oriented postoperative care. The authors believe that this level of care is best provided by a multidisciplinary team comprising a movement disorder neurologist, a neurosurgeon who is well-versed in stereotactic technique, a neurophysiologist, a psychiatrist, and a neuropsychologist. Additional support from neuroradiology and rehabilitation medicine is essential. A psychiatrist with expertise in psychiatric complications of movement disorders may be consulted to rule out active psychiatric disease and screen for relevant past psychiatric history that may pose a contraindication to surgery (eg, major depression or suicidality). Fluorodopa positron emission tomography (PET) may be performed in the unusual circumstance that an alternative diagnosis of multiple-system atrophy cannot be ruled out clinically. Finally, a medical evaluation is performed to determine the patient’s general fitness for surgery. In double-blind studies, neither transplantation of autologous adrenal medullary cells nor transplantation of fetal porcine cells has been found to be effective; both have been abandoned. Although open-label studies of fetal dopaminergic cell transplantation yielded promising results, 3 randomized, double-blind, sham-surgery–controlled studies found no net benefit. In addition, some patients receiving these transplants developed a potentially disabling form of dyskinesia that persisted even after withdrawal of levodopa. Sankar T, Lozano AM. Surgical approach to l-dopa-induced dyskinesias. Int Rev Neurobiol. 2011. 98:151-71. [Medline]. Fenoy AJ, Simpson RK Jr. Risks of common complications in deep brain stimulation surgery: management and avoidance. J Neurosurg. 2014 Jan. 120(1):132-9. [Medline]. Chen SY, Tsai ST, Hung HY, Lin SH, Pan YH, Lin SZ. Targeting the subthalamic nucleus for deep brain stimulation--a comparative study between magnetic resonance images alone and fusion with computed tomographic images. World Neurosurg. 2011 Jan. 75(1):132-7; discussion 22-4, 29-31. [Medline]. Mirzadeh Z, Chapple K, Lambert M, Dhall R, Ponce FA. Validation of CT-MRI fusion for intraoperative assessment of stereotactic accuracy in DBS surgery. Mov Disord. 2014 Nov 6. [Medline]. Weaver FM, Follett K, Stern M, Hur K, Harris C, Marks WJ Jr, et al. Bilateral deep brain stimulation vs best medical therapy for patients with advanced Parkinson disease: a randomized controlled trial. JAMA. 2009 Jan 7. 301(1):63-73. [Medline]. [Full Text]. Silberstein P, Bittar RG, Boyle R, Cook R, Coyne T, O'Sullivan D, et al. Deep brain stimulation for Parkinson's disease: Australian referral guidelines. J Clin Neurosci. 2009 Aug. 16(8):1001-8. [Medline]. Kwon Y, Park SH, Kim JW, Ho Y, Jeon HM, Bang MJ, et al. Quantitative evaluation of parkinsonian rigidity during intra-operative deep brain stimulation. Biomed Mater Eng. 2014. 24(6):2273-81. [Medline]. SVENNILSON E, TORVIK A, LOWE R, LEKSELL L. Treatment of parkinsonism by stereotatic thermolesions in the pallidal region. A clinical evaluation of 81 cases. Acta Psychiatr Scand. 1960. 35:358-77. [Medline]. Laitinen LV, Bergenheim AT, Hariz MI. Leksell's posteroventral pallidotomy in the treatment of Parkinson's disease. J Neurosurg. 1992 Jan. 76(1):53-61. [Medline]. Lang AE, Widner H. Deep brain stimulation for Parkinson's disease: patient selection and evaluation. Mov Disord. 2002. 17 Suppl 3:S94-101. [Medline]. Okun MS, Fernandez HH, Pedraza O, Misra M, Lyons KE, Pahwa R, et al. Development and initial validation of a screening tool for Parkinson disease surgical candidates. Neurology. 2004 Jul 13. 63(1):161-3. [Medline]. Tripoliti E, Zrinzo L, Martinez-Torres I, at al. Effects of subthalamic stimulation on speech of consecutive patients with Parkinson disease. Neurology. 2011 Jan 4. 76(1):80-6. [Medline]. Olanow CW, Kordower JH, Lang AE, Obeso JA. Dopaminergic transplantation for Parkinson's disease: current status and future prospects. Ann Neurol. 2009 Nov. 66(5):591-6. [Medline]. Kordower JH, Chu Y, Hauser RA, Freeman TB, Olanow CW. Lewy body-like pathology in long-term embryonic nigral transplants in Parkinson's disease. Nat Med. 2008 May. 14(5):504-6. [Medline]. Stover NP, Watts RL. Spheramine for treatment of Parkinson's disease. Neurotherapeutics. 2008 Apr. 5(2):252-9. [Medline]. Farag ES, Vinters HV, Bronstein J. Pathologic findings in retinal pigment epithelial cell implantation for Parkinson disease. Neurology. 2009 Oct 6. 73(14):1095-102. [Medline]. [Full Text]. Medtronics Activa Tremor control system consists of 3 components: (1) stimulating lead, which is implanted to desired target; (2) extension cable, which is tunneled under scalp and soft tissues of neck to anterior chest wall; and (3) pulse generator, which is programmable source of electrical impulses. Axial, fast spin-echo inversion recovery MRI at level of posterior commissure. Typical target for placing thalamic stimulator is demonstrated (crosshairs). Implantation of deep brain stimulation lead. Postoperative coronal MRI demonstrating desired placement of bilateral subthalamic nucleus deep brain stimulation leads. Deep brain stimulation lead is equipped with 4 electrode contacts, each of which may be used, alone or in combination, for therapeutic stimulation. Deep brain stimulation parameters can be adjusted at any time by using transcutaneous programmer.